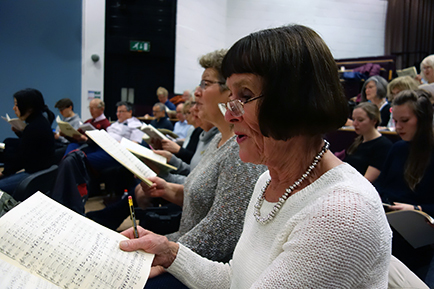 Become a member of the choir and enjoy exciting opportunities like singing with the Royal Philharmonic Orchestra in May 2019! In May 2019 we are privileged to be singing with the Royal Philharmonic Orchestra and top class soloists for a performance of Elgar’s Gerontius in one of the best concert halls in the country at Snape Maltings. 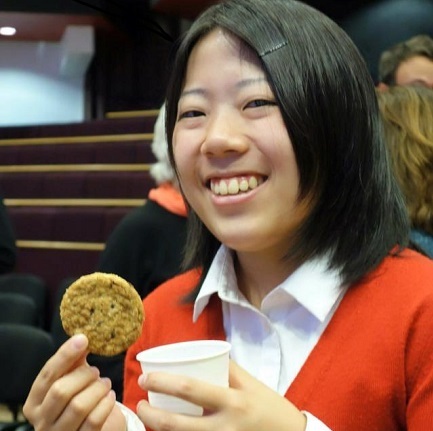 Every year new members are very welcome – you don’t need to be a member of staff or student at the University. Our singers are from all walks of life; musical novices to experienced singers, some still at school, others working or retired. We currently have a particularly vibrant group of students who work hard to promote the choir. The Choir rehearses on Thursdays in term time only and there are at least ten rehearsals in preparation for a concert. These take place in the Lecture Theatre Building (LTB) 6/7 on the Colchester campus, and are from 7-9.30pm with a tea break when we have a chance to meet new singers and chat with old friends. If you would like to see us in action come and listen to a rehearsal. 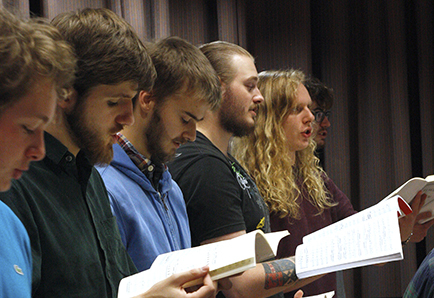 We will be pleased to see you – just email members@universityofessexchoir.org to arrange. Being in the choir is immensely rewarding and it is a joy to see how we progress from the first rehearsal to the concert day. Richard Cooke, our Music Director, works us hard and brings out the best in us. Our concerts are expectional and extremely well regarded. If you would like to join us there is a very simple voice test. Auditions are normally held in October and January or February at the first rehearsal for each new performance. Don’t be put off if you have never tried anything like this before. If you show potential you have a very good chance of being accepted into the choir. Email members@universityofessexchoir.org for more information. Be exceptional. Come and join us!